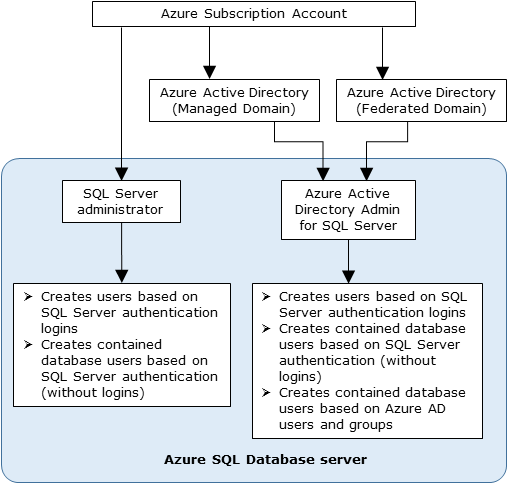 Azure Active Directory authentication is a mechanism of connecting to Azure SQL Database, Managed Instance, and SQL Data Warehouse by using identities in Azure Active Directory (Azure AD). Allows password rotation in a single place. Customers can manage database permissions using external (Azure AD) groups. It can eliminate storing passwords by enabling integrated Windows authentication and other forms of authentication supported by Azure Active Directory. Azure AD authentication uses contained database users to authenticate identities at the database level. Azure AD supports token-based authentication for applications connecting to SQL Database. Azure AD authentication supports ADFS (domain federation) or native user/password authentication for a local Azure Active Directory without domain synchronization. Azure AD supports connections from SQL Server Management Studio that use Active Directory Universal Authentication, which includes Multi-Factor Authentication (MFA). MFA includes strong authentication with a range of easy verification options — phone call, text message, smart cards with pin, or mobile app notification. For more information, see SSMS support for Azure AD MFA with SQL Database and SQL Data Warehouse. 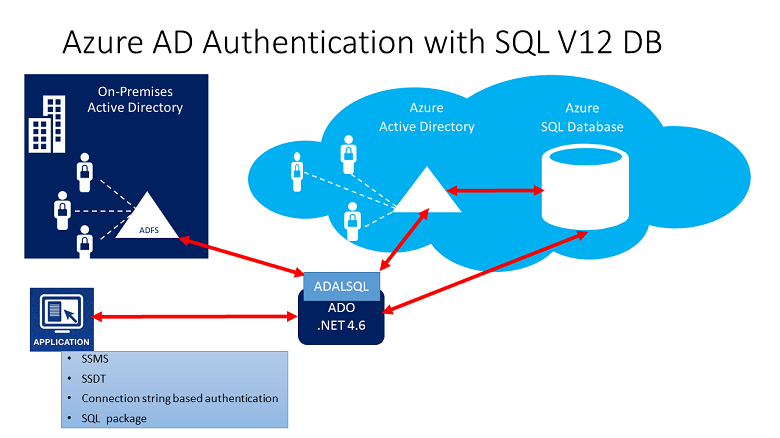 Azure AD supports similar connections from SQL Server Data Tools (SSDT) that use Active Directory Interactive Authentication. For more information, see Azure Active Directory support in SQL Server Data Tools (SSDT). Connecting to SQL Server running on an Azure VM is not supported using an Azure Active Directory account. Use a domain Active Directory account instead. The configuration steps include the following procedures to configure and use Azure Active Directory authentication. Create and populate Azure AD. Optional: Associate or change the active directory that is currently associated with your Azure Subscription. Create an Azure Active Directory administrator for the Azure SQL Database server, the Managed Instance, or the Azure SQL Data Warehouse. Create contained database users in your database mapped to Azure AD identities. Connect to your database by using Azure AD identities. To learn how to create and populate Azure AD, and then configure Azure AD with Azure SQL Database, Managed Instance, and SQL Data Warehouse, see Configure Azure AD with Azure SQL Database. 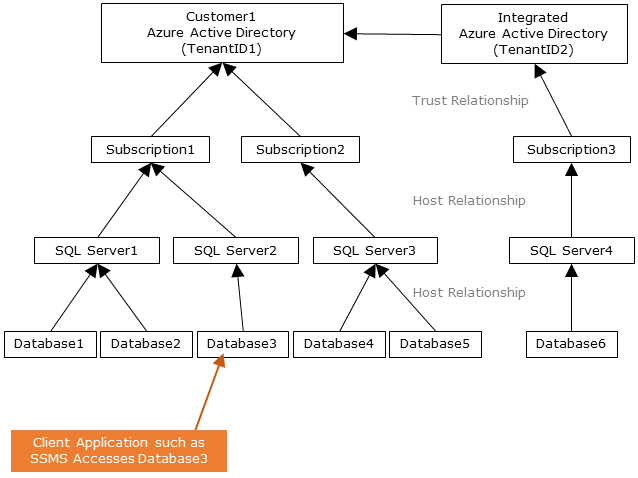 The following high-level diagram summarizes the solution architecture of using Azure AD authentication with Azure SQL Database. The same concepts apply to SQL Data Warehouse. To support Azure AD native user password, only the Cloud portion and Azure AD/Azure SQL Database is considered. To support Federated authentication (or user/password for Windows credentials), the communication with ADFS block is required. The arrows indicate communication pathways. The following diagram indicates the federation, trust, and hosting relationships that allow a client to connect to a database by submitting a token. The token is authenticated by an Azure AD, and is trusted by the database. Customer 1 can represent an Azure Active Directory with native users or an Azure AD with federated users. Customer 2 represents a possible solution including imported users; in this example coming from a federated Azure Active Directory with ADFS being synchronized with Azure Active Directory. It's important to understand that access to a database using Azure AD authentication requires that the hosting subscription is associated to the Azure AD. The same subscription must be used to create the SQL Server hosting the Azure SQL Database or SQL Data Warehouse. When using Azure AD authentication, there are two Administrator accounts for the SQL Database server and Managed Instance; the original SQL Server administrator and the Azure AD administrator. The same concepts apply to SQL Data Warehouse. Only the administrator based on an Azure AD account can create the first Azure AD contained database user in a user database. The Azure AD administrator login can be an Azure AD user or an Azure AD group. When the administrator is a group account, it can be used by any group member, enabling multiple Azure AD administrators for the SQL Server instance. Using group account as an administrator enhances manageability by allowing you to centrally add and remove group members in Azure AD without changing the users or permissions in SQL Database. Only one Azure AD administrator (a user or group) can be configured at any time. To create new users, you must have the ALTER ANY USER permission in the database. The ALTER ANY USER permission can be granted to any database user. The ALTER ANY USER permission is also held by the server administrator accounts, and database users with the CONTROL ON DATABASE or ALTER ON DATABASE permission for that database, and by members of the db_owner database role. To create a contained database user in Azure SQL Database, Managed Instance, or SQL Data Warehouse, you must connect to the database or instance using an Azure AD identity. To create the first contained database user, you must connect to the database by using an Azure AD administrator (who is the owner of the database). This is demonstrated in Configure and manage Azure Active Directory authentication with SQL Database or SQL Data Warehouse. Any Azure AD authentication is only possible if the Azure AD admin was created for Azure SQL Database or SQL Data Warehouse server. If the Azure Active Directory admin was removed from the server, existing Azure Active Directory users created previously inside SQL Server can no longer connect to the database using their Azure Active Directory credentials. Native members: A member created in Azure AD in the managed domain or in a customer domain. For more information, see Add your own domain name to Azure AD. Federated domain members: A member created in Azure AD with a federated domain. For more information, see Microsoft Azure now supports federation with Windows Server Active Directory. Imported members from other Azure AD's who are native or federated domain members. Active Directory groups created as security groups. SQL Error  [S0001]: The specified schema name 'user@mydomain.com' either does not exist or you do not have permission to use it. Grant the db_owner role directly to the individual Azure AD user to mitigate the CREATE DATABASE SCOPED CREDENTIAL issue. Azure AD server principals (logins) and users are supported as a preview feature for Managed Instances. Setting Azure AD server principals (logins) mapped to an Azure AD group as database owner is not supported in Managed Instances. An extension of this is that when a group is added as part of the dbcreator server role, users from this group can connect to the Managed Instance and create new databases, but will not be able to access the database. This is because the new database owner is SA, and not the Azure AD user. This issue does not manifest if the individual user is added to the dbcreator server role. SQL Agent management and jobs execution is supported for Azure AD server principals (logins). Database backup and restore operations can be executed by Azure AD server principals (logins). Auditing of all statements related to Azure AD server principals (logins) and authentication events is supported. Dedicated administrator connection for Azure AD server principals (logins) which are members of sysadmin server role is supported. Supported through SQLCMD Utility and SQL Server Management Studio. Logon triggers are supported for logon events coming from Azure AD server principals (logins). Service Broker and DB mail can be setup using an Azure AD server principal (login). To enhance manageability, we recommend you provision a dedicated Azure AD group as an administrator. Only one Azure AD administrator (a user or group) can be configured for an Azure SQL Database server or Azure SQL Data Warehouse at any time. The addition of Azure AD server principals (logins) for Managed Instances (public preview) allows the possibility of creating multiple Azure AD server principals (logins) that can be added to the sysadmin role. Only an Azure AD administrator for SQL Server can initially connect to the Azure SQL Database server, Managed Instance, or Azure SQL Data Warehouse using an Azure Active Directory account. The Active Directory administrator can configure subsequent Azure AD database users. We recommend setting the connection timeout to 30 seconds. SQL Server 2016 Management Studio and SQL Server Data Tools for Visual Studio 2015 (version 14.0.60311.1April 2016 or later) support Azure Active Directory authentication. (Azure AD authentication is supported by the .NET Framework Data Provider for SqlServer; at least version .NET Framework 4.6). Therefore the newest versions of these tools and data-tier applications (DAC and .BACPAC) can use Azure AD authentication. Beginning with version 15.0.1, sqlcmd utility and bcp utility support Active Directory Interactive authentication with MFA. SQL Server Data Tools for Visual Studio 2015 requires at least the April 2016 version of the Data Tools (version 14.0.60311.1). Currently Azure AD users are not shown in SSDT Object Explorer. As a workaround, view the users in sys.database_principals. Microsoft JDBC Driver 6.0 for SQL Server supports Azure AD authentication. Also, see Setting the Connection Properties. PolyBase cannot authenticate by using Azure AD authentication. Azure AD authentication is supported for SQL Database by the Azure portal Import Database and Export Database blades. Import and export using Azure AD authentication is also supported from the PowerShell command. Azure AD authentication is supported for SQL Database, Managed Instance, and SQL Data Warehouse by use CLI. For more information, see Configure and manage Azure Active Directory authentication with SQL Database or SQL Data Warehouse and SQL Server - az sql server. To learn how to create and populate Azure AD, and then configure Azure AD with Azure SQL Database or Azure SQL Data Warehouse, see Configure and manage Azure Active Directory authentication with SQL Database, Managed Instance, or SQL Data Warehouse. For an overview of access and control in SQL Database, see SQL Database access and control. For an overview of logins, users, and database roles in SQL Database, see Logins, users, and database roles. For more information about database principals, see Principals. For more information about database roles, see Database roles. For syntax on creating Azure AD server principals (logins) for Managed Instances, see CREATE LOGIN. For more information about firewall rules in SQL Database, see SQL Database firewall rules.